A dermatological-grade anti-aging treatment that contains the most advanced ingredients used by doctors to significantly reduce and prevent the signs of aging. It utilizes a proprietary combination of Peptides (Acetyl Hexapeptide-3 and Palmitoyl Oligopeptides) to provide visible short- and long-term results. Ultralight formula goes on invisible and matte and is guaranteed to provide substantial results. Significantly reduces the appearance of wrinkles and fine lines and visibly promotes firmer skin. Helps support the production of collagen and elastin: two biological elements that facilitate cell renewal and improve skin’s texture and elasticity. Gently massage a very small amount to face area until it absorbs. Use once or twice daily. After using it for a month and wondering why did I get so many breakouts since I started to use it, I finally came to the idea to read the real ingredients on the real packaging (the list on this website is not correct) and found paraffin listed in the formula. Whether this junk in the formula was not shown by mistake or on purpose, I find this product rather disappointing. Lots of other good ingredients in it, but overall not for the acne prone skin. I have tried a lot of different products and none seem to deliver what they promise. Most leave your skin feeling greasy instead of moisturized. I use this product twice a day. It seems to even out my skin and leave it feeling hydrated all day. 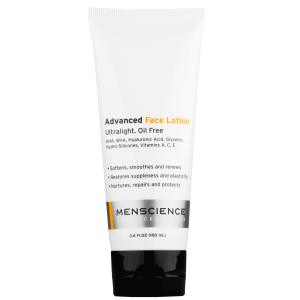 this is the first time that I've tried Menscience anti-Aging Formula, and so far I do believe I see a difference in the tone and texture of my face. My skin is more supple and even in tone. The product is really easy to use, and I also bought the Menscience moisturizer. They sem to work well together. Feels good. Too soon to see any results but I feel good about what may be coming down the road. I have tried a lot of stuff, but a beauty shop assistant recommended this men's product to me, due to the all the top ingredients like idebenone, and the low price. I gave a try, photographed my wrinkles every two weeks, and can really see a difference after 6 weeks, particularly on fine lines around my mouth which ar ebarely visible now. I am ordering my second bottle! This is a great product for moisturizing and getting rid of fine lines. My face feels great and I've only been using it a few weeks. Well worth the money. This product is just as excellent as Prevage, but less expensive. I have noticed my skin is healthier, more supple, and younger looking. It does everything it should, and even makes my fine lines less noticeable. I am 39 and fair-skinned. I have only been using it for a few weeks, and already notice the difference. This product is worth the money.